As China welcomes the Year of the Goat on Feb. 19, there’s a pretty good chance much of the adult population will be toasting the Lunar New Year with the national spirit, baijiu. The beverage (pronounced bye-joe) is actually the largest spirits category by volume in the world, given the fact that the drink’s home country accounts for about 20 percent of the planet’s population. But most of the other 80 percent, save for Chinese expat communities and the very well-traveled, have never even heard of it. In an effort to help change that, here are five things everyone should know to get acquainted with baijiu. It’s got a complex grain bill. The predominant base is sorghum, but it’s rarely the only one used in a particular batch. It can vary regionally, but usually sorghum is joined by standard rice or glutinous (sticky) rice, corn, wheat and anything else the distillers can get their hands on with enough starch to get the fermentation going. Different grain combinations in different proportions create flavor profile distinctions brand-to-brand and batch-to-batch. It incorporates a centuries-old production process that’s still used today. Where in beer, the wort is a fermentable liquid, the equivalent mixture in baijiu, pre-distillation, is a solid mass of compacted grains. The producers will steam the mix to soften it up, add a pulverized locally cultivated yeast culture and bury it in a fermentation pit dug in the ground and cover it all with mud from the pit. The mud’s been used over and over again for hundreds of years, breeding all sorts of beneficial microorganisms for generations. For that reason, some say a baijiu drunk in the 21st century may have traces of character from a batch made in the 17th. The mixture ferments underground for anywhere between two and four months—lengthy by any standards, but required to extract impurities from the grains. The distillers then put the fermented solid compound into porous vessels. They’ll boil water under those containers to begin distillation. The distilled liquid then goes in terra cotta jars for aging. The jars impart no additional flavor or color—the spirit remains clear when it’s done maturing, though it’s markedly mellower. It’s stronger than the average spirit, but if it’s well made, you won’t even notice. 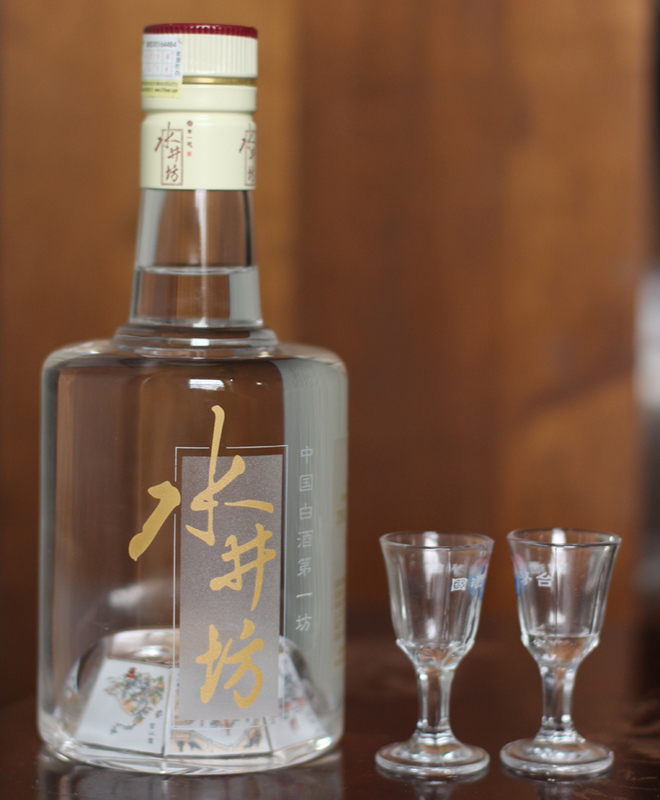 Baijiu typically has an ABV ranging between 50 and 60 percent, compared with the low 40s for the average spirit. Remarkably, when it’s a well-made brand, there’s barely any discernible alcohol burn on the nose or in the throat. Baijiu can be deceptively smooth. No, not that way. Baijiu is a key component of business dealings in China. Once contracts are signed, the parties involved usually toast to their collaboration with a few glasses of the spirit. Foreign dignitaries, including our own presidents, often will pour a few with Chinese leaders during summit meetings. Even Nixon reportedly shared in the ritual during his famous visit. Keep in mind that the typical serving vessel is a tiny half-ounce stemmed glass, “having a few” does not preclude people keeping their wits about them. But you don’t need to be a world leader or high-rolling international investor to appreciate the top-selling spirit in the world. It’s the perfect remedy to warm those first weeks of the Year of the Goat.